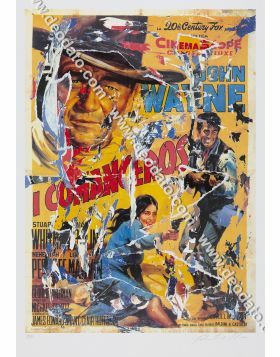 Mimmo Rotella's Seridecollage ripped by hand based on Let's Make Love (1960) starring Marilyn Monroe and Yves Montand. A French-born billionaire discovers that Broadway are putting on a show that makes fun of him. He went to the theater during rehearsals to block the show, but he is mistaken for an actor, and has to interpret itself. There he falls in love with the leading lady, and he tries to conquer her hiding his true identity. Bing Crosby, Gene Kelly and Milton Berle appear in the role of themselves.